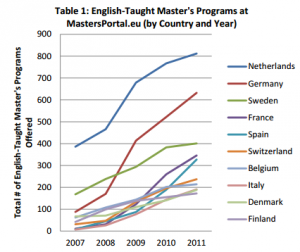 Non-English-speaking European countries are offering more English-taught master’s programs. An Institute of International Education study shows that European institutions are offering more English-taught master’s degrees to meet local and international student demand. The study analyzed MastersPortal.eu, a website where 960 EU universities post over 18,000 of their own master’s degree programs. 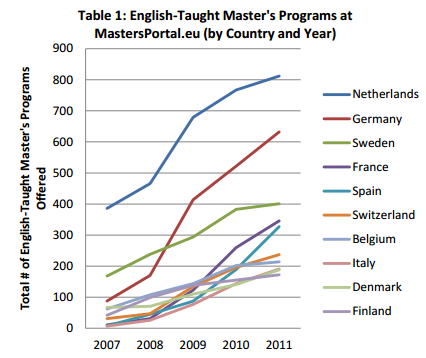 As of March 2012, a total of 5,444 master’s programs are being offered in English, a 38% increase from 2010. Of these programs, 79% are taught entirely in English and 21% in at least one language in addition to English. Why offer programs in English? For educational institutions, international students represent a large and profitable market. This market, full of potential tuition-paying students, cannot be ignored. Offering academic programs entirely in English allows for student recruitment to span the globe and can substantially increase university income. Additionally, university administrations worldwide are working to internationalize their institutions. Culturally diverse classrooms can create a more productive learning environment for all students. Armed with unique experiences and perspectives, students from abroad have the ability to fuel academic conversations and enhance classroom learning – something faculty and students alike can appreciate. The EU higher education system has been getting “overhauled” since the Bologna Declaration in 1999. The signatory countries (47 as of late 2011) are moving to a “three-cycle” higher education structure, separating bachelor’s, master’s, and doctoral degrees. The previous “two-tier” system, which doesn’t align with many other education systems, combined an undergraduate degree with a master’s. According to the European Higher Education Area, structure changes will “strengthen competitiveness and attractiveness of European higher education and foster student mobility and employability”. EU programs which are compatible with other countries’ educational structures can collaborate on a greater scale with larger education systems such as those in China and the USA. In the end, universities must adapt to stay competitive. Today’s students are more mobile and they have access to an ever-increasing number of academic options. The Internet allows students to quickly find information, in English, about graduate programs that exist all over the world and to choose the best and most attractive programs.